We tend to associate creaking, popping joints with old age, but your joints make tiny little noises every time you move, no matter your age. These noises are so faint, we usually can’t hear them with the naked ear. But one team of engineers at the Georgia Institute of Technology (GIT) wants to listen in on the noises made by joints, and they built a device that lets them do just that. The team shared a report of their progress in the online journal IEEE Transactions on Biomedical Engineering. The project started with a call for research proposals on rehabilitation technology from the Defense Advanced Research Projects Agency (DARPA). The military has a lot of motivation to advance rehab technology. From basic training to deployment, soldiers undergo intense physical stresses, whether that’s carrying hundred-pound backpacks, marching for miles and miles, or darting through an active war zone. "What most people don't know is that musculoskeletal injuries of the knees and ankles are among the top reasons for discharge for active duty service members," GIT engineer and paper co-author Omer Inan said in a press statement. But like products developed for NASA, technologies created with the military in mind often trickle down to civilians. Inan, for example, is not a career military man, but he was a discus thrower in college and has first-hand (or first-knee) knowledge of the strain athletes put on their joints. Although he retired from sports years ago, Inan can still feel—and hear—the damage in his knees. He and his colleagues realized that those snapping, crackling, popping noises might be a good indicator of injury. They created a knee band outfitted with microphones and vibration sensors that record sounds in the air and inside the body. "It's a little bit like some kind of Halloween stuff happening,” Inan said. “You're listening to your bones rubbing on each other, or maybe cartilage." 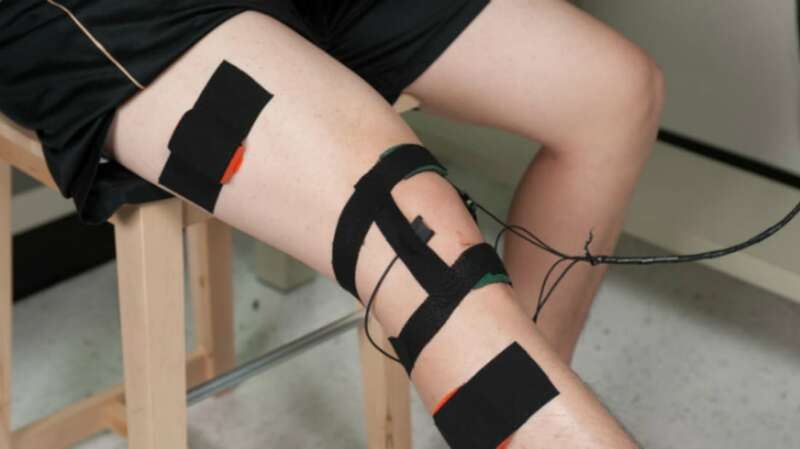 The in-body noises of both healthy knees and damaged knees sound pretty disgusting, but they do produce different patterns of sound, which could make the knee band a great diagnostic device. Though progress has been made, the device is not quite ready yet. Getting a clear recording can be hard; our joints are surrounded by fluid, which can dampen sound waves that emanate from the joint. Additionally, the recordings must be taken while a patient is moving, but that movement makes its own noises. Inan and his colleagues will continue to test and improve their design, and the medical technology world will be listening closely.